Dapper Day Spring 2018 With the Fam! 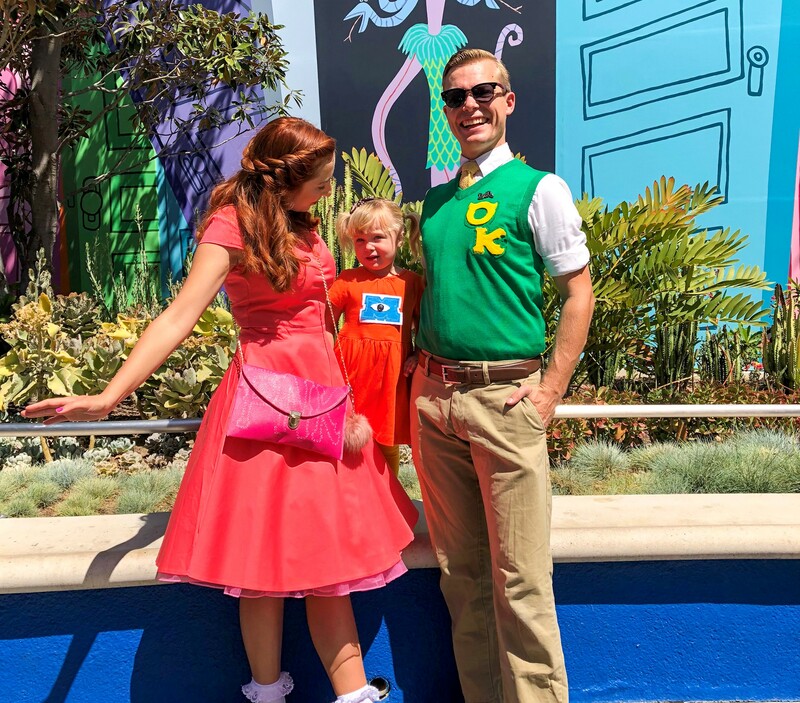 For my outfit, I was channeling the PNK sorority, my husband was a member of the Oozma Kappa fraternity, and my daughter was Archie the Scare Pig! We did Dapper Day on a budget by getting most of our clothes on one of my favorite affordable go-to places: Amazon! I got my dress for just $26 on Amazon, and my husband got his green sweater there as well. For shirt, tie, and my socks and petticoat I had on-hand from previous Dapper Days. For my daughter’s dress and tights, I found them on Primary, a great online store if you are looking for Disneybound or colorblock items for kids. For the OK patch, and my daughter’s MU patch, my husband cut and layered from felt, to make it look like a true embroidered patch. He then attached iron-on adhesive to the back, and ironed on the clothes. To add the PNK logo to my look, my husband painted on the words PNK on my purse in a style to look like stitching. It fooled a lot of people, most people thought the letters were embroidered on the purse! Hanging out by the Drive-In Wall in Cars Land, had to take advantage of the Monsters Inc-themed photo opp! We had a great (and very colorful) time at Dapper Day Spring 2018! Did you head to the parks for Dapper Day? I would love to hear what you dressed as or what you wore in the comments!